The return to the video-game world of Wreck-It Ralph certainly expands on the already imaginative playground of arcade game characters. While the first film certainly had an intelligent charm, I still felt there was untapped potential for an adventure that deserved more than an onslaught of puns. The sequel, on the other hand, takes a bold step out of the arcade and into the boundless limits of the Internet. 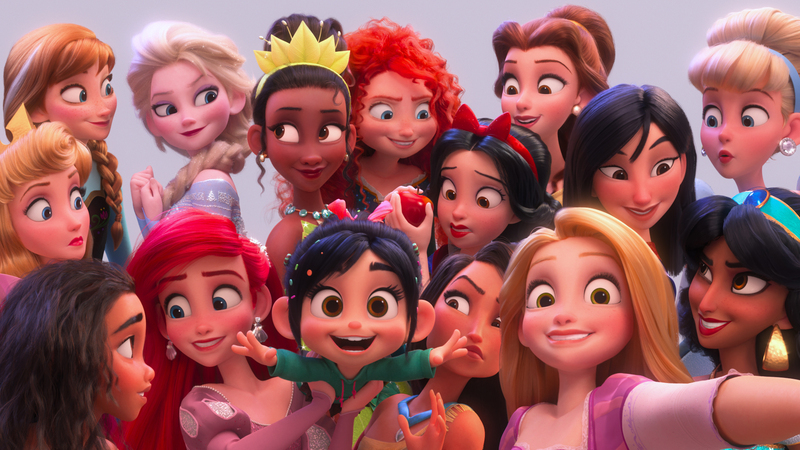 But while Ralph Breaks the Internet still has that clever charm, it still feels held back from its full potential, despite a heftier dose of the heartfelt. Ralph and Vanellope’s friendship is challenged when they journey into the Internet in search of a replacement part for her game. © 2018 Disney. All Rights Reserved. Life in the arcade has been peaceful. Vanellope (Sarah Silverman) has become somewhat accepted in her game of Sugar Rush, as has building pulverizer Ralph (John C. Reilly) in Fix-It Felix. But Vanellope has become stuck in a rut, desiring more than the same three race tracks. A jolt of the divergent sends her game into peril when Sugar Rush is unplugged, and the only way to turn it back on is to find a replacement part—thankfully, the arcade owner (Ed O’Neill) has just plugged in a Wi-Fi router, providing the perfect portal for our two heroes to venture through to save the game (again). The story takes many twists and turns from here, sending Ralph and Vanellope to the many nooks and crannies of the bustling online world, seen as a towering metropolis that stretches forever. They meet a search-engine coordinator (Alan Tudyk) with the design and personality of a character that looks like he escaped from a Rocky and Bullwinkle bit. A video streaming manager (Taraji P. Henson) wants to make Ralph a viral star. An online street-racer game becomes of particular interest to Vanellope, considering its open world and the inspirational but ruthless driver Shank (Gal Gadot). Ralph and Vanellope find themselves in need of making some serious cash. © 2018 Disney. All Rights Reserved. Before seeing the film, I kept hearing the same fears from many people based on the trailers: that this would be nothing more than The Emoji Movie loaded with Disney references. I knew going into it that this assertion would be false. Walt Disney Animation Studios have proven with Big Hero 6, Zootopia, and Moana that they do not slap together their worlds from mere buzzwords. Returning director Rich Moore would never put such little effort into tackling the Internet landscape, and he does an exceptional job at being both apt and absurd with codirector Phil Johnston (writer, Zootopia) and cowriter Pamela Ribon (Moana). Every aspect of the Internet is portrayed with clear thought behind it, from Ralph’s brief viral fame to the dangers of a denial-of-service attack. There are even some clever little Easter eggs—for example, take a look at the rusted remains of the old Internet and you’ll see a girder labeled GeoCities in the background. Vanellope meets the Disney princesses. © 2018 Disney. All Rights Reserved. Similar to the first film, Ralph Breaks the Internet has an undeniable sweetness but with a message so tightly wedged into its digital adventure it needs to be beaten in as hard as Ralph wrecks buildings. There are even a few great missed opportunities, as with the characters of Fix-It Felix (Jack McBrayer) and Sergeant Calhoun (Jane Lynch) considering the next step in their relationship. Where the film succeeds greatly is in its savaging of Disney’s tropes, including a brilliantly absurd musical sequence about a Grand Theft Auto–esque gaming world. And for that daringness, the film has a playful enough spirit to be worth a watch, even if it never reaches the high score.